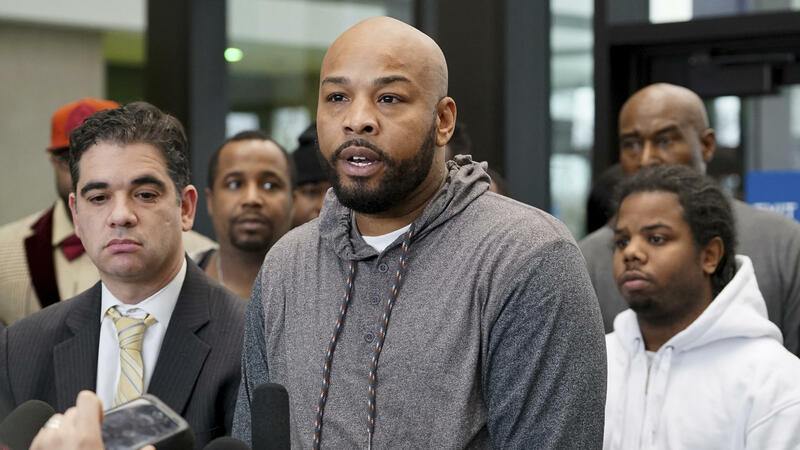 Leonard Gipson, one of 15 men who say corrupt Chicago police framed them and whose convictions were thrown out, talks to reporters Thursday. Four years ago, Watts was convicted of extorting money from a drug dealer who turned out to be an FBI informant. Prosecutors in the Cook County State's Attorney office said after reviewing the cases of the 15 men, the office didn't have confidence in the police reports and testimony. They asked the court to throw those cases out and said they are looking into several more that are tied to Watts' command. Defense attorneys with the University of Chicago's Exoneration Project filed a petition last spring asking for the cases to be overturned. Attorney Joshua Tepfer said it's "extraordinarily powerful" to have prosecutors take that step. He added that Watts was involved in nearly 1,000 cases and nearly 500 convictions which are now suspect. Thursday's hearing for the 15 defendants came after the release earlier this week of another man in a separate case. Chicagoan Arthur Brown had spent decades in prison for crimes he said he did not commit. The Cook County State's Attorney dropped the charges against him saying an investigation showed there were deep concerns about the fairness of Brown's conviction on murder and arson charges. In a statement Thursday, Chicago Mayor Rahm Emanuel and Police Superintendent Eddie Johnson said they have zero tolerance for abuse, misconduct or any unlawful action by those who are sworn to uphold laws. They said the actions of Watts must be condemned and they would continue to work to ensure the abuses are never repeated. A judge in Chicago threw out the felony drug convictions of 15 black men yesterday. And defense attorneys called it an unprecedented mass exoneration. NPR's Cheryl Corley reports it's the latest chapter in the scandal involving a former Chicago cop. CHERYL CORLEY, BYLINE: After their convictions were overturned, about a dozen of the men stood with defense attorneys and prosecutors in a courthouse lobby. They had similar stories. They said they ended up in prison or on probation because former Chicago Police Sergeant Ronald Watts framed them. The men claimed the shakedowns went on for years. Here's 36-year-old Leonard Gipson. LEONARD GIPSON: I would never pay him. So Watts always told me, if you're not going to pay me, I'm going to get you. And every time I ran into him, he put drugs on me - every time. CORLEY: Gipson served four years. Watts served time, too, convicted four years ago of stealing money from a drug courier who was an FBI informant. Defense attorneys with the University of Chicago's Exoneration Project helped get the cases of the 15 men tossed. Mark Rotert, the prosecutor who heads the state's attorney's Conviction Integrity Unit, says they've reviewed each of the cases. MARK ROTERT: We concluded that, unfortunately, the police were not being truthful. And we couldn't have confidence in the integrity of their reports and their testimony. And so in good conscience, we could not see these convictions stand. CORLEY: Prosecutors and defense attorneys say there may be more to come. They are both examining dozens more cases that involved Ronald Watts and officers under his watch.